Home / Where is Desalination Used in the UK? Where is Desalination Used in the UK? Desalination is a process that involves the removal of salt from seawater. A great deal of investment has been made worldwide in the desalination of saline water to produce a source of drinking water not dependent on recent rainfall. There are over 16,000 desalination plants in the world, the largest being the Jubail plant in Saudi Arabia. In Israel, 40 per cent of domestic water supplies come from desalinated water making it the country which makes the greatest percentage use of this source. Although desalination is obviously useful in dry countries some will be surprised to learn that we make use of such plants here in the UK. Jersey has a small plant, built in 1970, but the first large-scale desalination plant to be built on the mainland was the Thames Water Desalination Plant in Becton, East London, opened in June 2010 amid much controversy. A legal challenge to reverse planning permission was made by Ken Livingstone in 2005 and withdrawn by Boris Johnson in 2008. 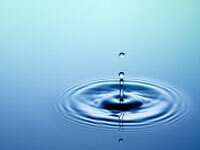 Many thought the water shortage problem could be solved by the repair of leaking existing pipework. However, the desalination plant was thought necessary by Thames Water partly because of an expected increase in population of 700,000 by 2021 and partly because of the likely increase in hot summers as a result of climate change. The tidal part of the river consists of a mixture of both saltwater and freshwater. The plant takes this water during the last three hours of the ebb tide and puts it through a four-stage filtration process which can turn 85 per cent of the tidal river water into drinking water- many plants use a three-stage filtration process and turn just 50 per cent of saline water into drinking water. A process called reverse osmosis is then used to remove the salt. In this process the water is forced at high pressure through fine semi-permeable membranes which hold back salt and other molecules including minerals. The water therefore has to be re-mineralised to make it taste like water people normally drink from traditional supplies and purified so it is safe. Thames Water anticipates the plant will work at full capacity only during times of drought and prolonged periods of low rainfall. Then it will be able to supply up to 1 million people (or 400,000 households) with all their water needs. The plant will only be used when needed as the whole process is energy expensive, though it does use 100 per cent renewable energy such as biofuels like cooking oil to minimise any environmental impact. A 14 kilometre pipeline transports water from Beckton to North East London. The problems of increasing population levels and the likely effects resulting from climate change will soon affect areas in the UK other than London. The Institute of Chemical Engineers sees at least four desalination plants being built on coastlines and estuaries within the UK by 2050, to cope with the anticipated growing demand. For wastewater treatment services from professionals you can trust, please contact the expert at Wildon UK. Our drainage contractors can help find a solution that meets your needs, whether it’s at home or in the workplace. Simply call us today.